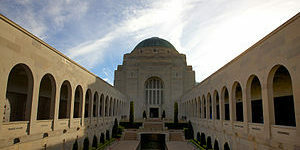 Two men listed on the Hintlesham memorial are also commemorated at Australia's National Memorial in Canberra. 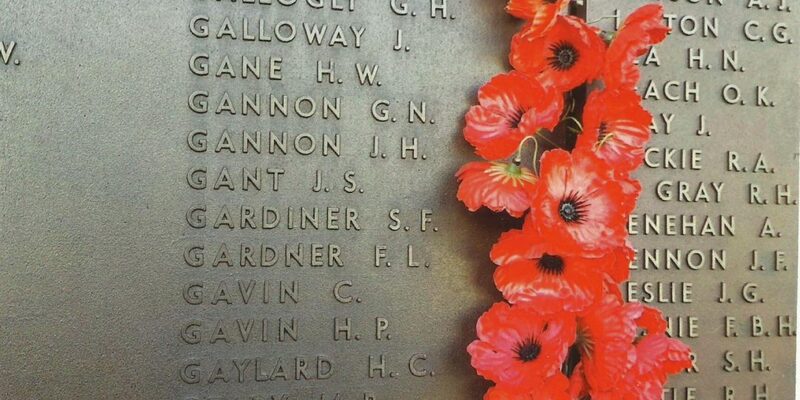 John "Jack" Gant MM and Clarence Wilkinson emigrated to Australia prior to the Great War and served and died in the Australian Infantry. Clarence's father was Hintlesham's vicar and John "Jack" Gant was born at Whatfield but was brought up on a farm in Hintlesham and attended the village school. Chris Parker, whose parents live in Duke Street, works in Sydney and recently visited the memorial and found the names on the memorial. He placed a poppy by each name and kindly took photographs. 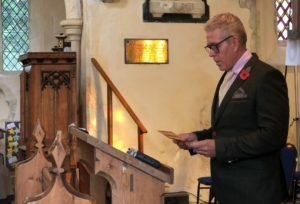 On Sunday 11 November 2018, there was a special service to mark the 100th anniversary of the Armistice. 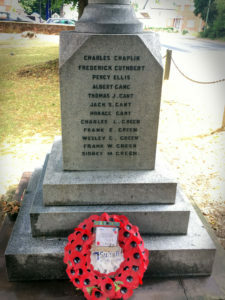 Part of the event saw 29 men and 1 woman take on the roles of men listed on the village memorials. "Empty Chairs" was filmed and can be viewed here. 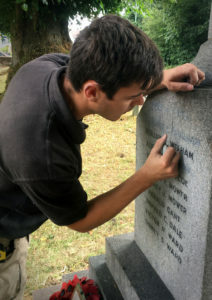 Pictured: Laurie Arthurs from Essex, who read the part of his great uncle, Harry Thorpe, who is listed on the memorial in Chattisham. .
With the help of funding from the Hintlesham Parish Council, the lettering on the memorial has been restored. Suffolk Masonry Services spent two days fixing the raised lead letters and re-painting. After a couple of years treating the algae, lichen and moss, the memorial is once again looking spick and span in time for the 100th anniversary of the WW1 Armistice on 11 November 2018. Many British military records have been lost and fire damaged over the years. Fortunately, the records in Australia have survived in much better condition and many of them are now online. 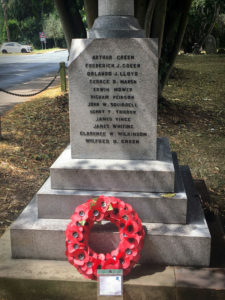 Two local men, commemorated on the Hintlesham Memorial, served with Australian forces. 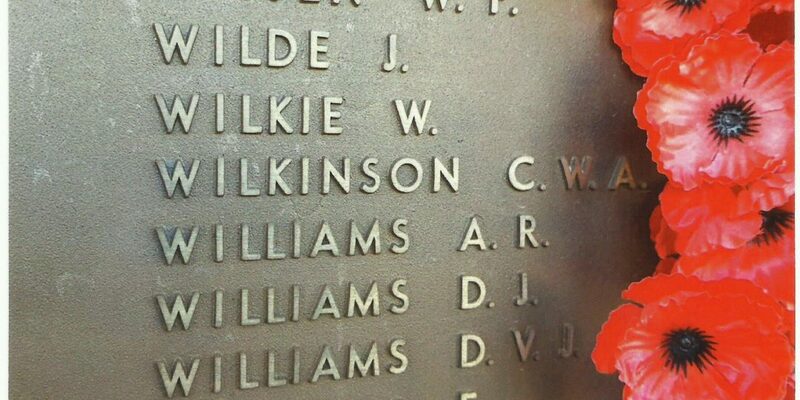 Clarence Wilkinson and Jack Gant fought in the Great War; Clarence in Gallipoli and Jack on the Western Front. 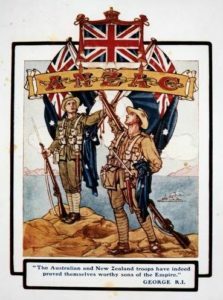 This website has helped to correct some of the records in Canberra (You can't blame some overworked Australian WW1 army orderly struggling to spell Hintlesham!). Their stories, like that of all the men, are remarkable, heroic and truly tragic. 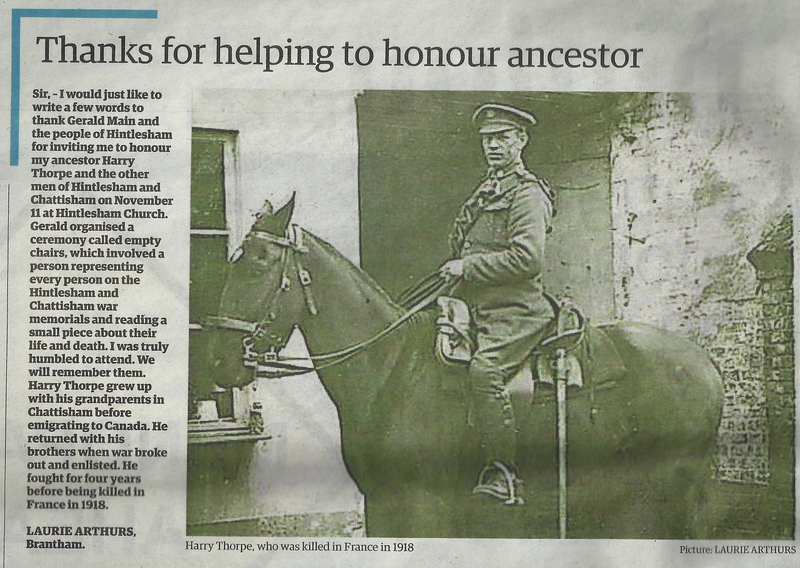 To discover Clarence and Jack's stories see Hintlesham WW1 page . 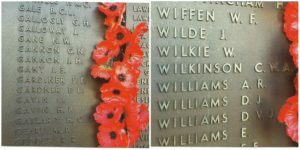 Update: The family of Clarence Wilkinson, now living in Australia, have subsequently "discovered" their links to Hintlesham and found this website. As a result, the entry for Clarence Wilkinson has been re-written and updated. The internet is a wonderful thing. 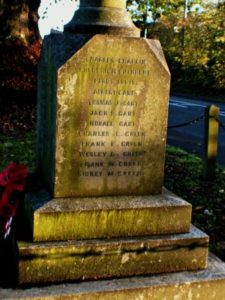 By this time of year in 1916, the horror of The Great War was all too evident in our villages of Hintlesham and Chattisham. 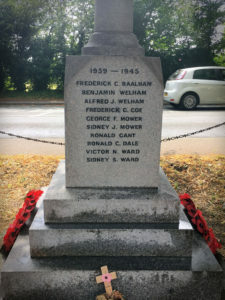 By this time, half way through the war, 12 of the men listed on our memorial in Hintlesham had died and another 2 on the memorial in Chattisham. By 1916, in villages like ours, everyone would have either lost a relative, a friend, a workmate or someone they simply knew who used to sit right here where we are today. The villagers of course didn’t know they were only half way through. "It’ll all be over by Christmas!" Probably not, they’d said that in 1914 and it didn’t end. They said it in 1915 and it wasn’t over then? When would this lousy war and it’s killing be over and done with? Perhaps, by November 1916, that patriotic jingoistic enthusiasm for the war that was so evident in 1914 had faded somewhat. The summer of 1916 saw our local lads and young men, who predominantly worked in the fields we see and pass each day, involved in warfare and killing on an industrial scale never seen, let alone imagined, before. With the Great War, we tend to think first of trenches and the Western Front, but the summer of 1916 saw the biggest sea battle of the war between the Imperial German High Seas Fleet and the Royal British Navy’s Grand Fleet. It took place 90 miles off the coast of Denmark at Jutland Bank. The battle involved 250 ships and lasted the duration of daylight hours on 31st May – by nightfall nearly 10,000 men were killed and 25 ships lay at the bottom of the North Sea. To this day historians argue over who won and who lost. Stoker Marcus Steward lost. 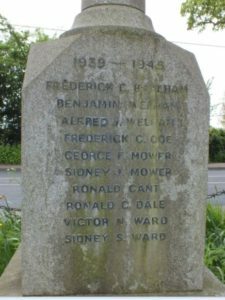 He lost his life that day and is listed on the memorial at Chattisham. The Battle of the Somme began on 1st July and ended on the 18 November 1916. A million men died or were injured in this the largest battle of the first world war … the British Army alone suffered 57,000 casualties just on the first day … in truth it was a series of battles fought over several months … 5 of the men listed on the memorial outside were killed, lost or died of their injuries during the course of The Somme. 100 years on, the events of 1916 still have the power to shock, to horrify and even to sicken us – no wonder the returning Tommys and Jack Tars wouldn’t talk about it. 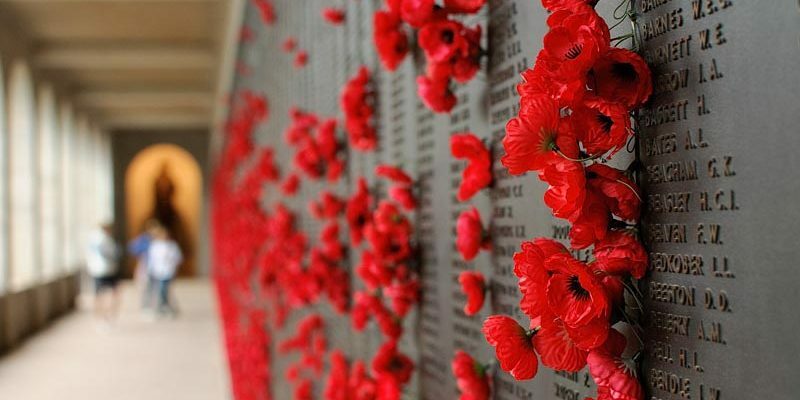 Today we remember the names of the fallen. We know fragments of their story, but we can only imagine the grief, the sorrow and total bewilderment of those left behind in Hintlesham & Chattisham as the news of the carnage emerged. How many mothers, fathers, brothers, sisters, sons, daughters, aunts, uncles, cousins, mates, friends and neighbours must have sat in these church pews of Hintlesham and Chattisham and prayed for the safe keeping or for the souls of those they loved … in 1916. The 1st July 1916 was the worst day in the history of the British Army. The series of attacks on that long bloody Saturday on the Somme cost the lives of 20,000 British soldiers with a further 40,000 wounded. The battle lasted 4 months before becoming literally stuck in the mud in November. By the “close of play” the British had suffered 420,000 casualties, the French 190,000 and the Germans 620,000. With such unimaginable numbers, it was inevitable men from Hintlesham and Chattisham would appear in the lists of wounded and killed. 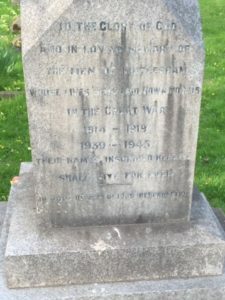 However, “our” first casualty of that summer was Stoker 1st Class, Marcus Steward who was born in Washbrook and killed, aged 27, in the Great War’s largest sea battle off the coast of Jutland, Denmark. His ship, HMS Queen Mary, was sunk at 5:25 pm on 31st May 1916 with the loss of over 1200 men. 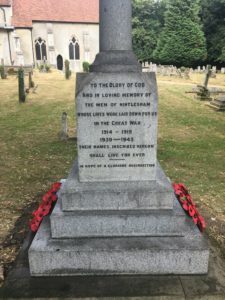 (There is a photo of the ship and her final moments at www.hintleshamwarmemorial.com) Marcus is commemorated on the war memorial inside the church in Chattisham. Next was Pte. James Vince who had lived on Duke Street and died of his wounds on 8 August 1916 aged 28. He served with the 4th Battalion of the Suffolk Regiment. Ten days later, on 18 August 1916, Pte. Albert Game was killed in action fighting with the 4th Battalion. Albert was the son of a watchmaker and lived on George Street. Hintlesham’s fourth casualty of the Somme was Pte.Thomas Gant. He was just 19 years old when killed on 29 September 1916 and has no known grave. Thomas is therefore listed on the Thiepval Memorial which towers above the Somme … along with 72,000 other names who shared his fate. Thomas’ older brother, Jack, also died in the war serving with the Australian infantry. The final local victim of the Somme was Pte. Percy Ellis, aged 21, who had lived on Back Road in the village. He was a farm labourer before enlisting in Ipswich. He was killed in action on 3 November 1918 as the Battle of the Somme was drawing to a close. It is much easier to trace the records of those killed on the Somme than those who fought and survived the summer of 1916. The truth is many more men survived the Great War than were killed, but their footprint in history is fading fast. One can only imagine what horrors those men returning to Suffolk had experienced and the painful memories they couldn’t erase. Sadly, so many of them couldn’t, or wouldn’t, talk of their experiences. They too were victims of the Somme and deserving of our gratitude and recognition. 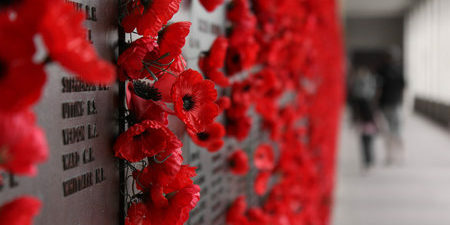 We shall remember them … all of them. From part of the vigil held in St Nicholas Church, Hintlesham on 3 August 2014 - the eve of the 100th anniversary of the outbreak of the Great War. There are things we know about the Great War and our village and there are things we can clearly imagine. We can imagine – 100 years ago this evening the men of the village drinking in the pub, smoking and talking about the impending war. Asking each other how had it all come about. There was no talk of war back in the early summer - what had changed? We can imagine talk of enlisting, the bravado, the patriotism and for some the sheer adventure of it all. For others, the attraction of regular pay, regular food and clothes and boots that kept you warm and dry. Yes, we can imagine for many there was much to look forward to as soon as the harvest was brought in. We can imagine it all. So, to things we know are facts. We know for a fact Orlando, on this night 100 years ago was with the 2nd battalion of the Suffolk Regiment based at the Curragh in County Kildare, Ireland. He was there with Charles Green who was born in Hintlesham and both served as Privates. They were professional soldiers and experienced in army ways. They'd served in Malta and Egypt ... and knew what was what. We also know for a fact that on the outbreak of war, the battalion quickly returned to England. We know for a fact the battalion joined the British Expeditionary Forces in France on 17 August 1914. They landed at Le Havre. Orlando and Charles were part of what the Kaiser called "this little contemptible army." We know for a fact less than a week after arriving in France, the first great battle of the war took place on 23 August 1914, at Mons. It was the first major European conflict since Waterloo in 1815. The British fought well and despite being outnumbered inflicted heavy casualties on the Germans, However, the B.E.F. were so outnumbered, eventually, they had to retreat. And we know for a fact they headed south west ... and if they continued in that direction Paris would surely be taken. It was decided to launch a rearguard defensive action at a small French town called Le Cateau. The battle began on 26 August 1914 and the order was to stand and fight. We know the Suffolks were positioned on a ridge near the town. The 2nd Battalion was tasked with providing cover for other units to withdraw and to slow down the German advance. Their orders were to stand fast. For 8 hours, out gunned and out manned, they did just that. Charles and Orlando were in the thick of it. Unlike Mons, where the riflemen and infantry played the main roles, this battle was all about artillery, big guns and the hot metal of exploding shells and shrapnel. The Germans pleaded with the Suffolks to surrender rather than take further losses. But those who were left stood firm. Out of 1000 men in the 2nd battalion of the Suffolks, The Battle of Le Cateau claimed 720 casualties either killed, injured or captured. Two of the fallen were Private Orlando Lloyd from Burstall and Private Charles Green from Hintlesham. Their bodies were never recovered and their remains lie somewhere under the French soil on that ridge above the small town of Le Cateau. 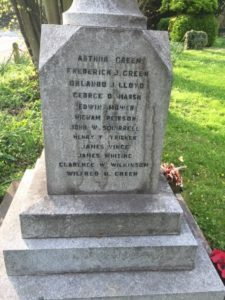 Orlando and Charles are commemorated on the La Ferte-Sous-Jouarre Memorial in France and on our memorial in Hintlesham churchyard. What we know and what we can imagine .... perhaps we can imagine Sarah’s reaction when she received the telegram – perhaps? 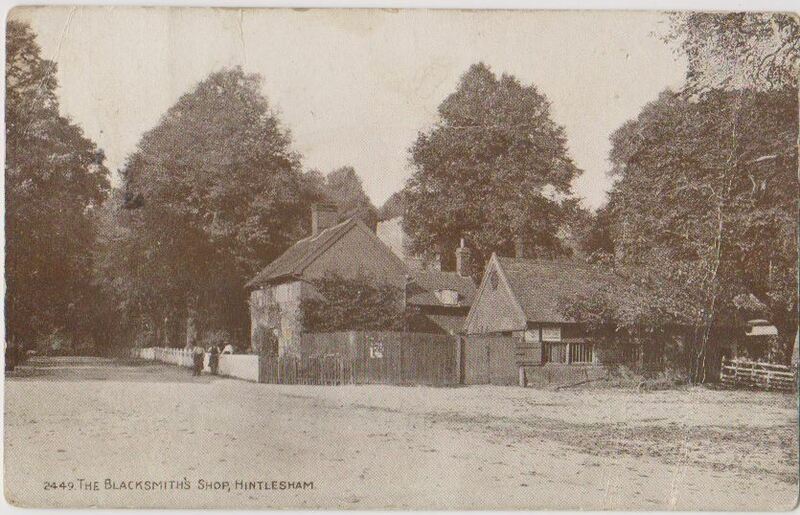 But what we know, for a fact, is that in the course of the following four years many, many other similar telegrams would be delivered - telegrams that heralded unimaginable grief and loss for families in Hintlesham, Chattisham ... and across the land. *Unknown at the time of writing, Sarah and Orlando, had a daughter in November 1913. Sarah remarried after the war and lived at Primrose Hill, in Duke Street. 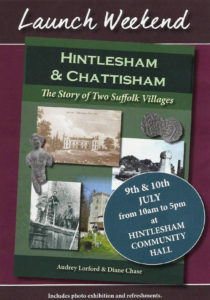 Congratulations to Audrey Lorford and Diane Chase on the publication of their new book about the history of Hintlesham and Chattisham. It was launched in the village in July . It's a fantastic piece of work full of local pictures and stories about the two villages over the last few thousand years! There's an extensive section on the war years including many stories of those who served and survived. This is no flimsy cheap and cheerful local history booklet - it's a quality hardback which delights throughout its 375 pages thanks to the authors' real passion for the subject.